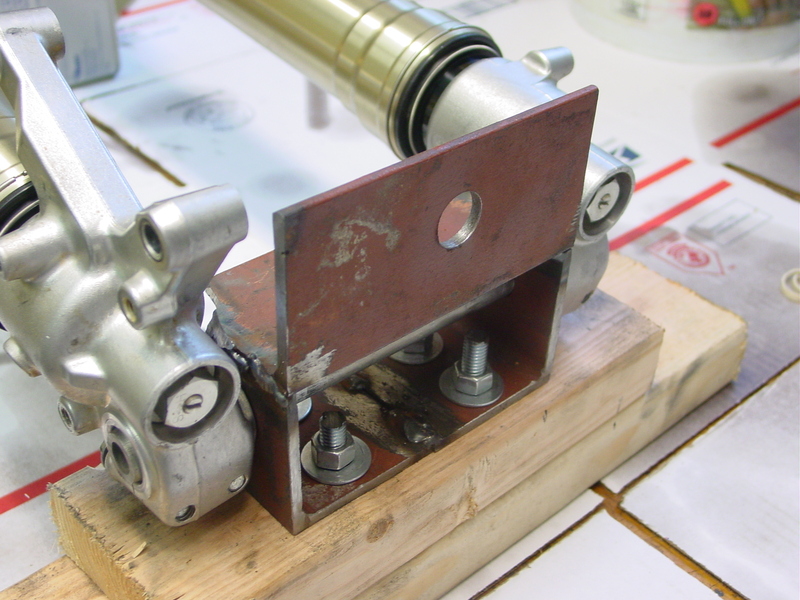 I had been trying to sell the triple clamps from my KX 125 on eBay for several weeks now. 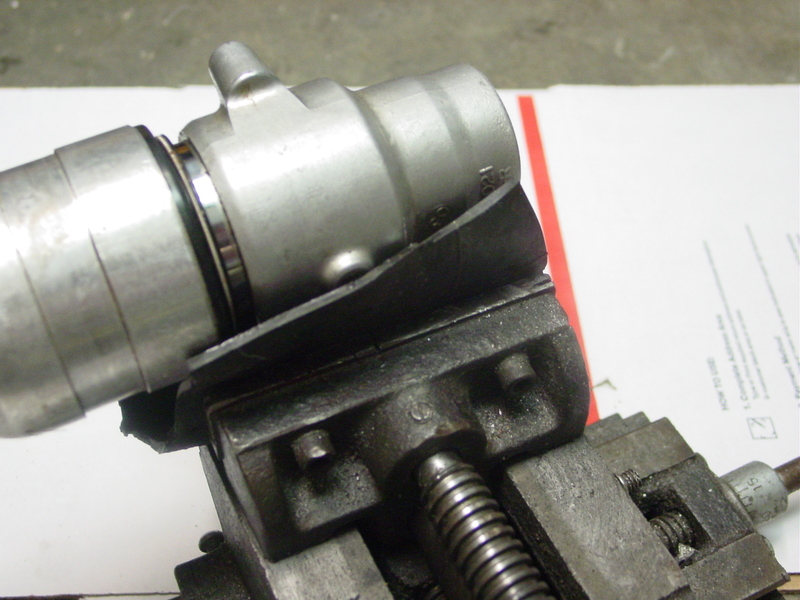 The upper clamp was a barely used Pro Taper. Once it got down to $5 and still wouldn’t sell, I had a better use for it – fork work station. 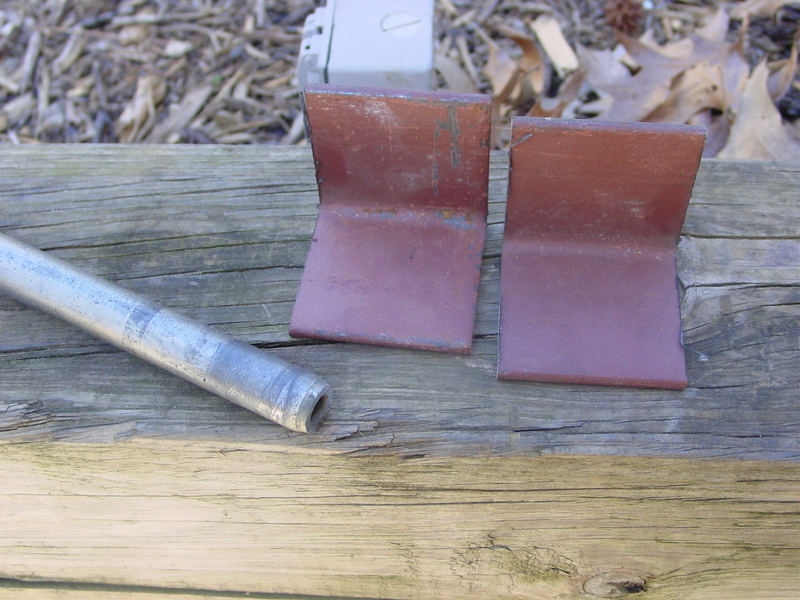 Up until today, I had used my vice and old rubber inner tube to work on my forks. 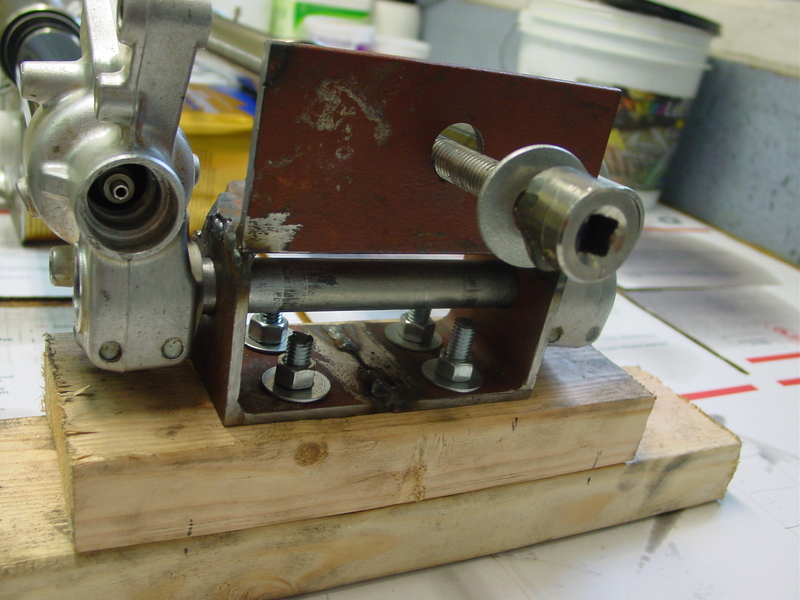 To get started, I used an old front axle, lower triple clamps and some angle iron. Little bit of cutting. . .
and welding and this is the main part of my work station. 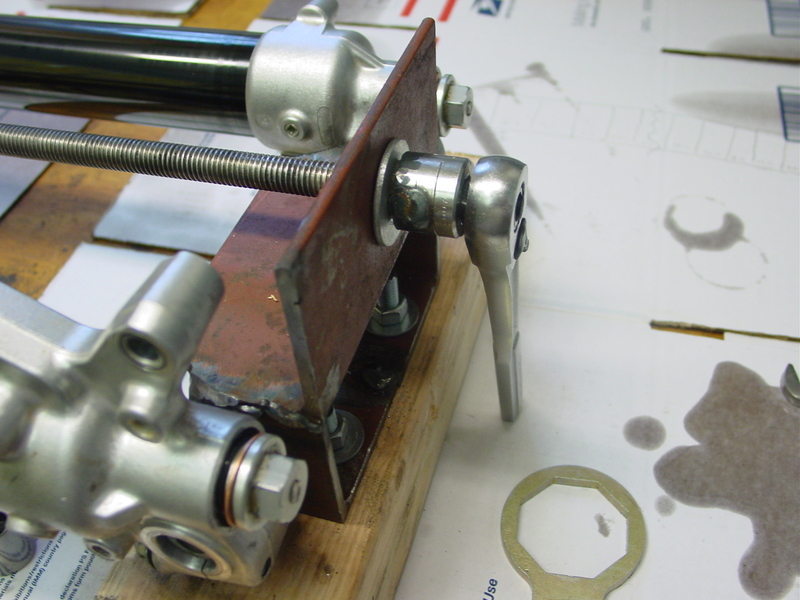 I drilled and tapped two holes on the opposite side of the lower clamps. 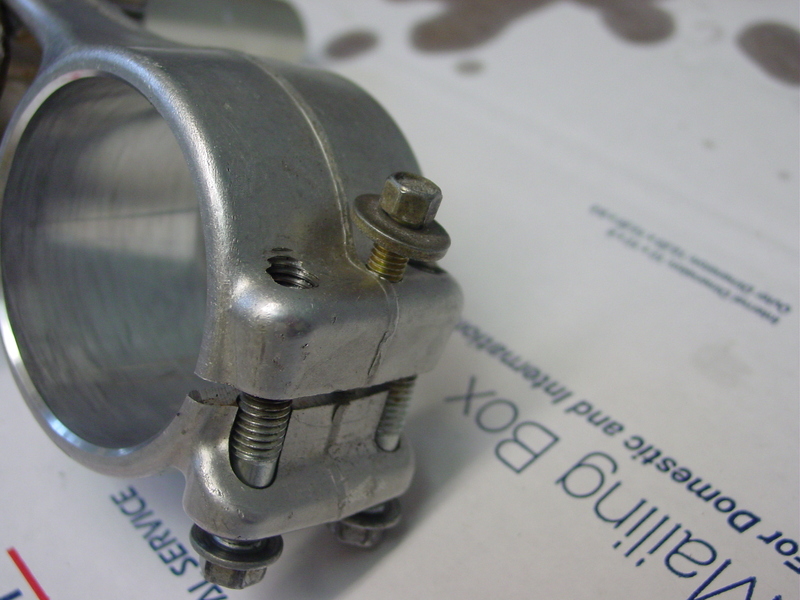 When you tighten this bolt, it spreads open the lower clamp so the forks slide in easier (assuming you’ve loosened the pinch bolts first). 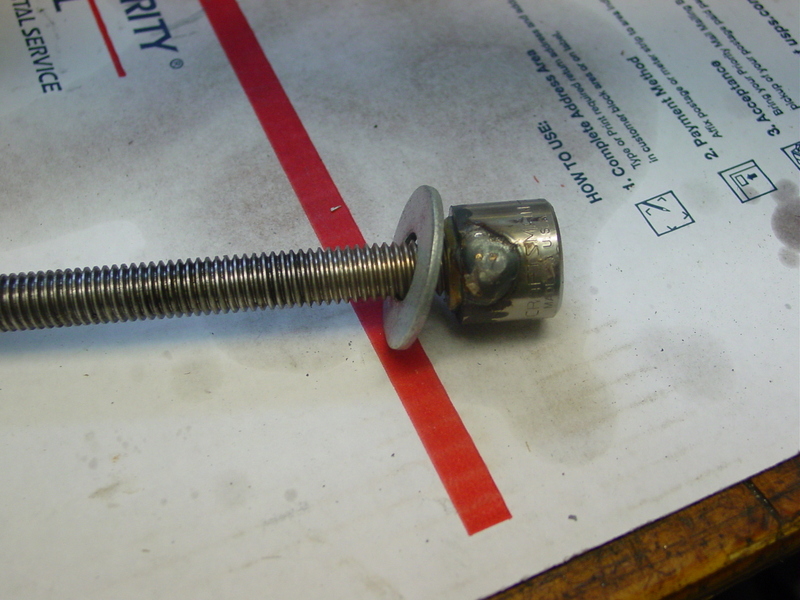 I went to Home Depot and got some 1/2″ threaded rod, two nuts and a washer. 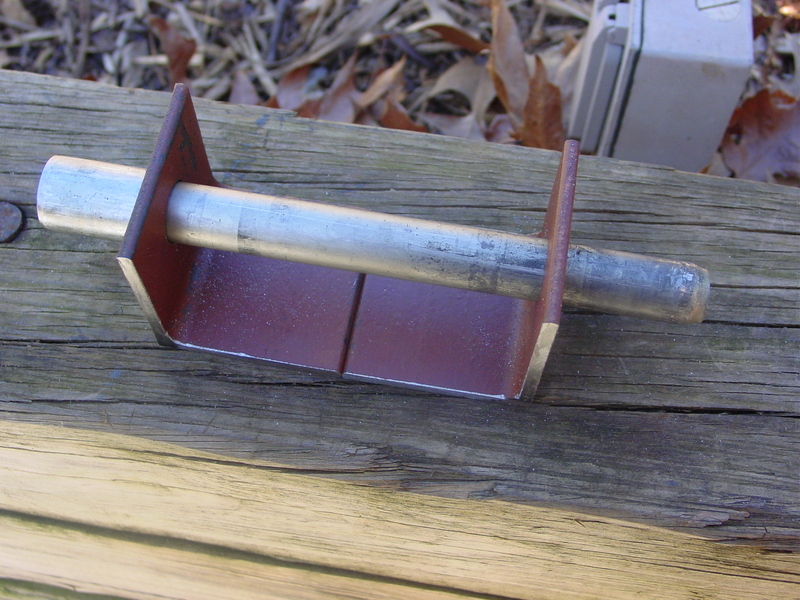 After welding a nut on the end of the threaded rod, I welded an old socket to the nut. 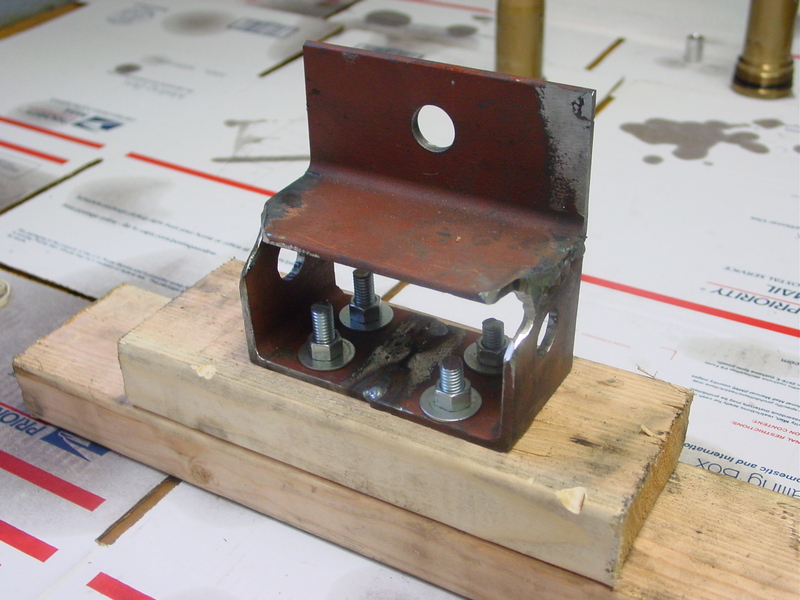 I used some ugly welds to weld the other nut to a small piece of steel plate. 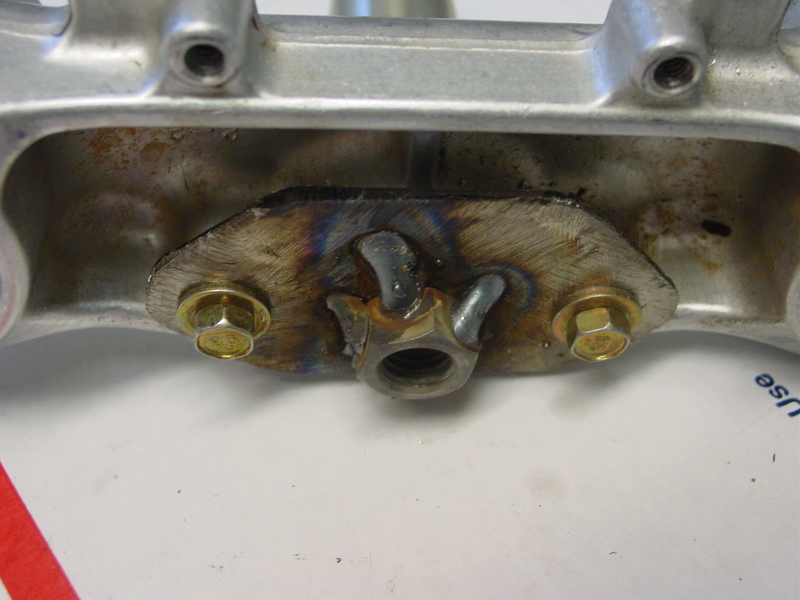 That got bolted in place using 2 of the fender mounting holes. That nut sits in line with the hole in the steering stem. Here is everything I used to get the forks back together. 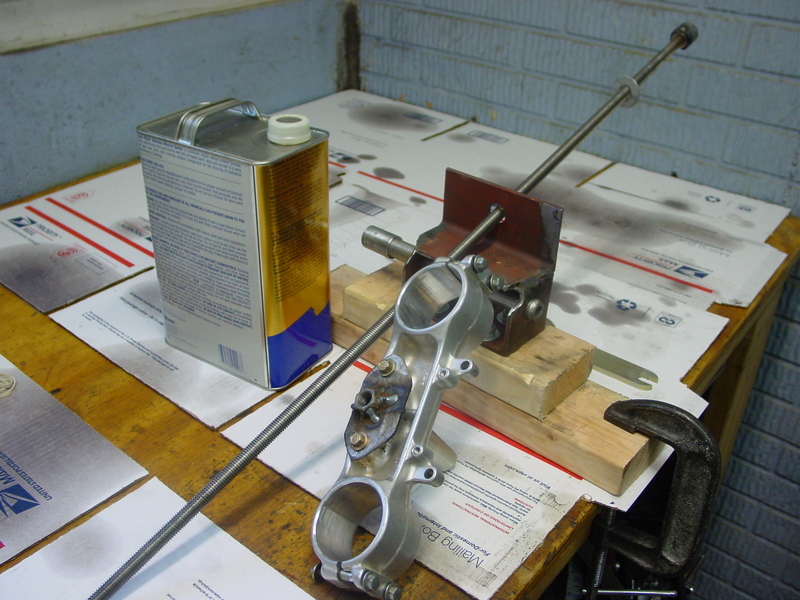 Once it stops raining, I’ll cut some 2×4’s to replace the paint thinner can (that just holds the forks so they are parallel to the table). So now it is time to put this to use. 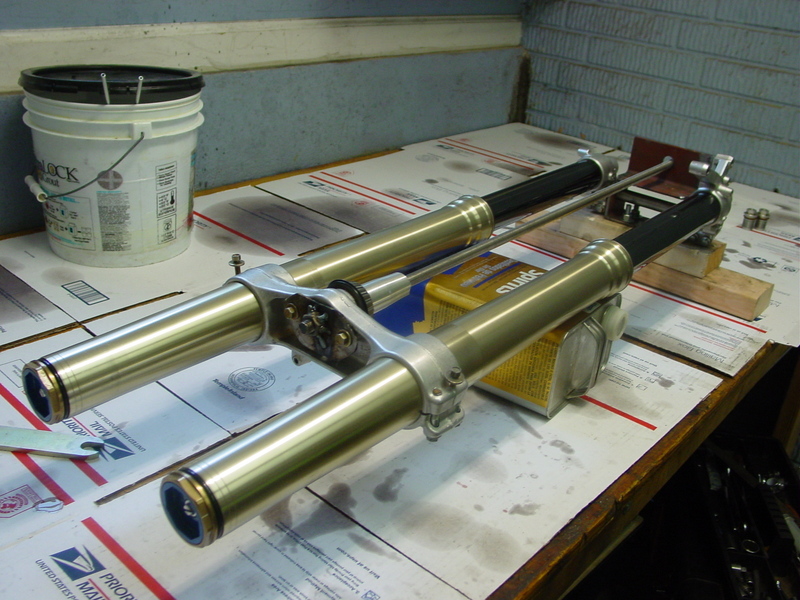 First step is putting the axle in the base and then sliding the forks onto each end of the axle. 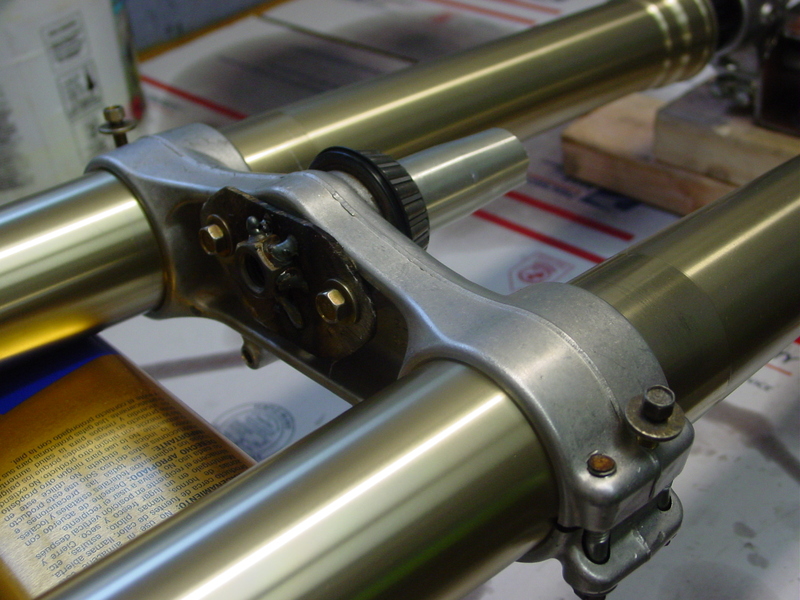 Expand the triple clamp so it slides over the fork tubes. 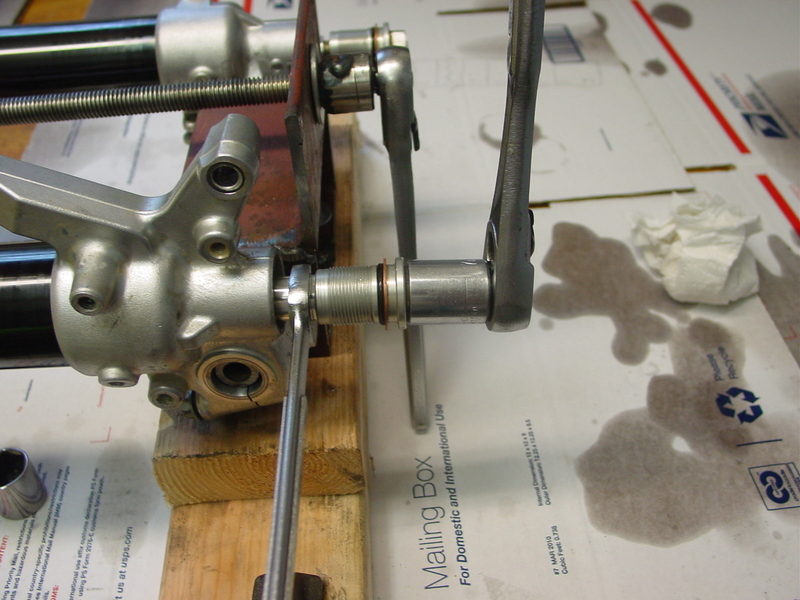 Loosen the expander bolt and tighten the triple clamps to hold the tubes in place. 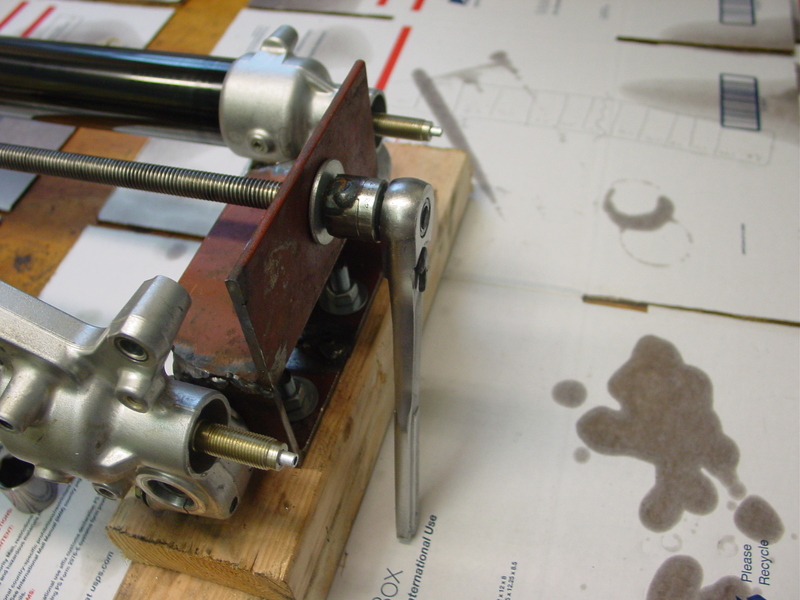 With the cartridges now in the fork tubes, insert the threaded rod through the hole in the base and get the threads started on the nut on the other side of the triple clamps. Ready to start compressing the forks. 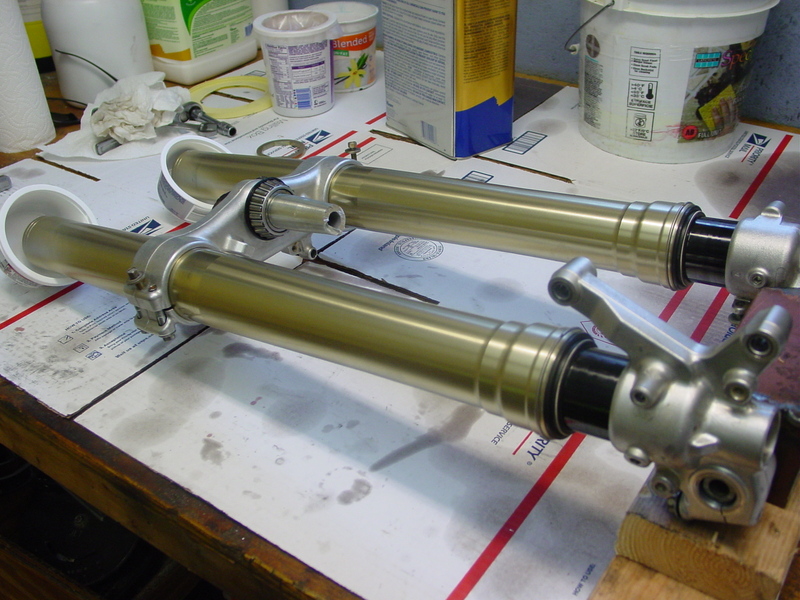 The coarse threads of the rod made pretty quick work of compressing the forks. Previously I could only work on one fork at a time and would have to manually compress the fork, get the jam nut threaded and then use the other end of the fork cap wrench to hold the fork in that compressed state. This is what the other end of the forks looked like when compressed. Piece of cake now to do both at the same time. 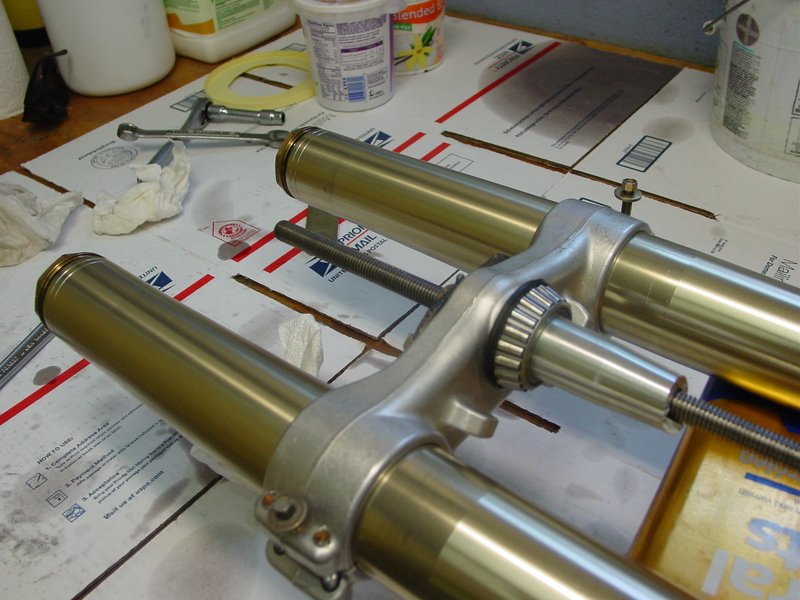 Slowly un-compress the forks until the rebound bolt can be tightened. 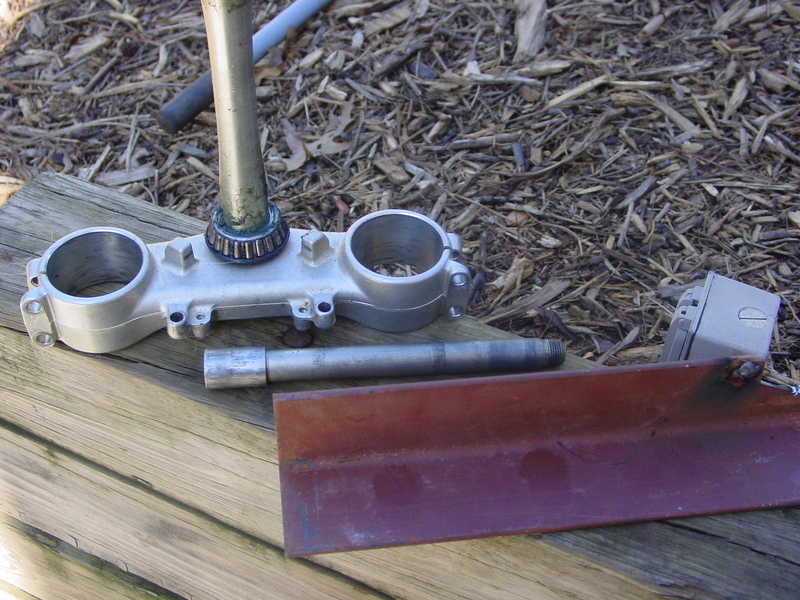 I built this when I was waiting for the loctite to dry on the mid-valves, so I’ve only used it to put the forks together. Next time I take them apart, I also plan to use this to drain and capture the residual fluid left on the springs and in the tubes. To date I’ve just been turning them upside down, leaning them against the wall and letting them drip onto the cardboard. Should be much cleaner. This entry was posted on March 13, 2012 by Harold Bawlzangya Racing. It was filed under Modifications .